The original source of all the water we use is rain which is itself soft. However, once the rain falls to earth it runs through the rock strain and dissolves from it metal salts such as those of Calcium and Magnesium. In many areas of Britain the water coming from the mains or a borehole is a solution of these salts. This is called HARD WATER because of the hard deposits caused in water systems when the salts come back out of solution like a rock turning back to rock. Soap and hard water do not go well together. More soap is needed to create a lather and a soap scum is often seen. By using a water softener soaps and detergent use is much less to get the desired effect. Water softeners work by a process know as ion exchange. The hard water passes through a high quality cation exchange resin column inside a pressure vessel. The resin removes the positively charged Calcium and Magnesium ions from solution and exchanges them for the ions of Sodium, When the resin becomes exhausted it is regenerated by drawing a solution of common salt called brine through the column. During regeneration the hard metal ions are then released from the resin and replaced again with those of Sodium from the brine. The unwanted ions are flushed to drain along with the excess brine. Regeneration takes between 60 to 180 minutes depending on the size of the softener. Softeners are used in a variety of industries, typical examples are glass washing, boiler feed, cooling towers, chillers and protecting industrial equipment. A simplex water softener has to regenerate every so often depending on flow rate and usage. They are best suited to consistent demand applications of moderate total water consumption. Regeneration is controlled by the multiport valve head assembly. Time clock and delayed regeneration meter controlled softeners are normally programmed to regenerate at 2.00am or at a convenient period of low water usage. 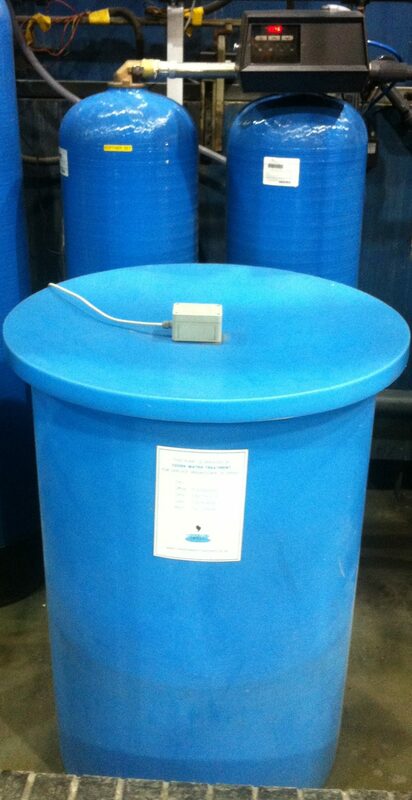 Immediate regeneration meter controlled softeners regenerate the resin column as soon as the water meter zeros out. During regeneration the single column control valves will bypass hard water to service unless a bypass closedown facility is specified. Generally simplex softeners will need to be sized to give at least one days softened water output before regeneration. A duplex water softener supplies a constant supply of softened water this is essential for companies who need to run their plant 24 hours. Duplex systems use two resin columns, one in service, the second on standby. The water flow to service is metered and when the service column is exhausted, the control valve automatically switches back to the first column again. Duplex softeners are normally sized to give one regeneration per column per day, but each column can be regenerated more frequently if required. Parallel run systems with both vessels on line at the same time are available. How soft will the water be? A water softener will usually effectively reduce water hardness to zero. There will usually be a small leakage level of hardness. This can be reduced further by increasing the salt use when regenerating the water softener. Leakage will be worse if the level of dissolved solids is very high. In very bad water, there is a threshold level of salt use on the ion exchange resin, below which the water softener cannot be used. What is the maximum flow I can get through my water softener? The maximum flow through a water softener is usually limited by the size of the pipework and the increasing loss of pressure as you try to put more water through the softener. There are recommended limits, though, for using ion exchange resin in a water softening application. Typically 40-50 bed volumes per hour are quoted by the manufacturers so, for 100 litres of ion exchange resin, you can soften up to 5,000 litres per hour. How long you can do this for will depend on the hardness of the feed water. Don’t try to soften water at a very low rate; it may tend to find the easiest path through the ion exchange resin and exhaust these first, leaking hard water before the whole of the ion exchange resin in the water softener is exhausted. photo shows a duplex water softening plant which is part of a full water treatment package which was installed commissioned and is now on a bimonthly service contract with cedek.